Charges have been filed against Zequiel E. Ahrns, age 23, regarding an inmate overdose that occurred within the facility on March 20, 2019 at 3:27 p.m. On this date, corrections officers responded to a housing area in the facility for an inmate, Joseph D. Meinerding, age 22, who was not breathing. Corrections staff administered CPR until Mercer County EMS arrived and transported Meinerding to Mercer Health. Six dose of NARCAN were administered to Meinerding, reviving him and saving his life. The investigation revealed that Ahrns had smuggled fentanyl into the facility upon his arrest on March 19. Ahrns has been charged with illegal conveyance of drugs on to the grounds of a detention facility, a felony of the third degree, two counts of aggravated trafficking in drugs, felonies of the fourth degree, and one count of aggravated possession of drugs, a felony of the fifth degree. All related to this incident. Ahrns was being held on one count of burglary and one count of theft, prior to this incident. His bond on this case was set at $250,000. Additionally, Ahrns was charged with two counts of kidnapping, first degree felonies; two counts of robbery, second degree felonies; one count of escape, a third degree felony; and two counts of assault, fifth degree felonies. Bond was set at $750,000. These additional charges were filed for on incident the evening of March 25, 2019, when Ahrns violently attacked two corrections officers and took control of tasers in an attempt to escape the facility. When officers from Celina Police Department, the Ohio State Highway Patrol, and Sheriff’s deputies arrived, a corrections officer was able to convince Ahrns to put down the tasers and she was able to handcuff Ahrns to bring him under control. 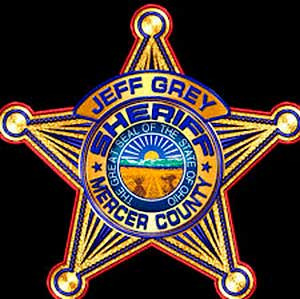 The two corrections officers, one male and one female, were treated by medical staff at the detention facility and then transported to Mercer Health where they were treated and released. They are currently on medical leave due to this incident. “I want to thank Celina PD, OSHP, and responding deputies,” stated Sheriff Grey, “their presence helped Ahrns decide to surrender as he realized there was no way out.” The incident and response lasted eight minutes.